Returning to the Milkwaukee Mile oval last season after a race promoter fiasco cancelled the 2010 activities at the track, there was questions whether the IZOD INDYCAR Series was going to appear at the complex in 2012. A less-than stellar track audience and TV audience put open wheel racing in doubt until Michael Andretti rescued the Wisconsin state spectacle. Still occurring on Father's day weekend, there is a change to the 225-lap event from the previous year. As opposed to the 2011 race, the 2012 Milwaukee Indyfest was event scheduled early on Saturday afternoon. In Friday afternoon qualifying, Honda-engined IZOD INDYCAR competitors continued to show force with the 2012 Dallaras. 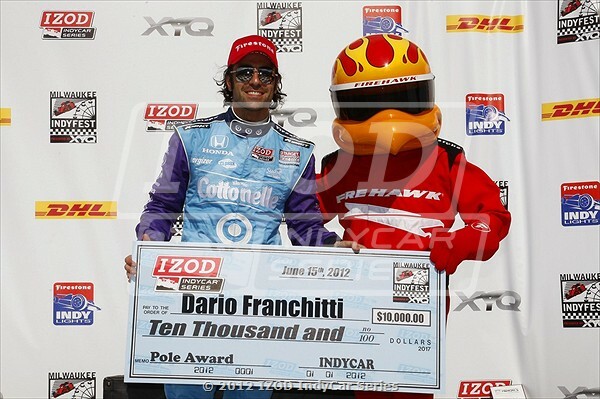 Accomplishing a two-lap speed average of 168.737 miles per hour, Dario Franchitti took pole for Saturday's Milwaukee Indyfest for the Target Chip Ganassi Racing team. After qualifying the #10 car on pole, Franchitti expressed some surprise from the fast effort after practice. "Practice is one thing, qualifying is another and then there is the race. For as warm as it it people are fighting the car and everyone wants the same line. I expect tomorrow is going to be tough, especially at the end of a full - stint on those Firestone tires." said Dario Franchitti. Perhaps on the momentum of the Texas Motor Speedway upset win, the #18 Dale Coyne Racing car piloted by Justin Wilson continues to impress on ovals. "The confidence has helped a lot." said Wilson adding, "I feel like we've made some progress in understanding this car and what it's looking for, so we'll keep chipping away at it and making the car better and better." While qualifying 2nd, Justin Wilson will fall to 12th on the start of the 2012 Milwaukee Indyfest because of an unapproved engine change after the Texas race. Will Power's #12 Team Penske car, the #67 Sarah Fisher Hartman Racing car of Josef Newgarden, the #15 Rahal Letterman Lanigan Racing vehicle of Takuma Sato and the Mike Conway driven #14 AJ Foyt Enterprises machine have also been handed grid position penalties of 10 spots. Promoting the race through his sports event business arm, Michael Andretti's three-car team had mixed fortunes in qualifying. While Ryan Hunter-Reay's #28 car was the fastest Chevrolet-engined competitor presented as 3rd on the time sheet, James Hinchcliffe tied his worse starting spot of the season with a 13th place grid position. Marco Andretti will start 15th on the 1-mile oval with the #26 Chevrolet-powered Dallara. Visiting the Milwaukee mile for the first time, 2012 IZOD INDYCAR freshman Rubens Barichello place his #8 KV Racing Technology car 5th fastest between two Team Penske machines. Josef Newgarden for Sarah Fisher Hartman Racing also had a very respectable 7th quickest time but will forfeit 10 grid positions Saturday. "Knowing that we had the penalty coming here wasn't too bad because it's been a cycle this year. Everyone's had to go through it at some point and it's just our turn." said Newgarden. A race with 25 cars, the 225-lap Milwaukee Indyfest main event is scheduled for a 12:30pm Eastern time start. According to weather forecasts, a slight chance of thunderstorms could threaten the race on Saturday.